Contact the Green Office Certification Program (GOC) with your intentions for pursuing a certification by filling out the interest form on our web page here or feel free to email us at greenoff@ucsc.edu. The entire Green Office Certification process should take 3-4 weeks and 3-4 hours of the Green Team’s time. The main role of the Green Team is to be the champions for their office and to be liaisons between the office and the GOC staff. 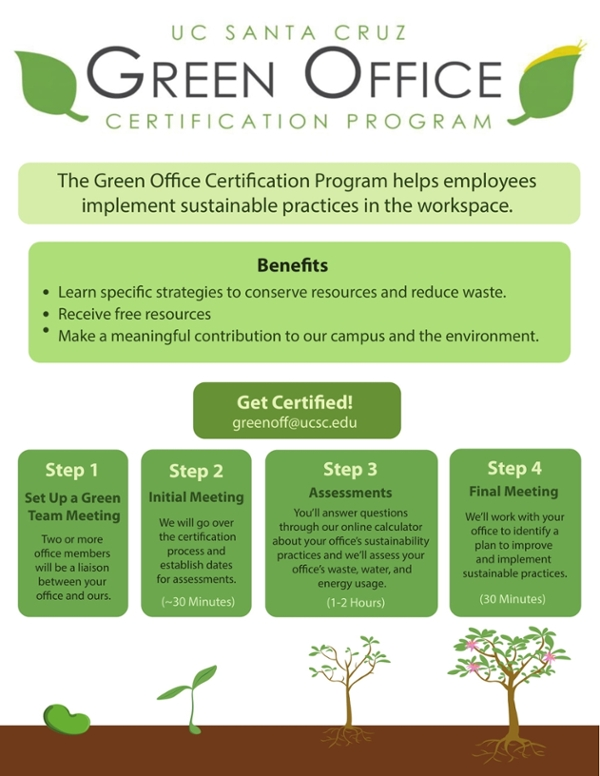 The GOC Green Team is a key component in the green office certification process. Along with the roles described below, the Green Team should be comprised of staff whom have a genuine interest in both encouraging their peers to make the move towards sustainability and in setting a prime example of how a sustainable staff should manage oneself. Green Team members will need to assist GOC staff in scheduling meetings and communicating with Building Managers/Office Manager/Department Head regarding waste assessments, building information, etc. Students are allowed to be a part of the Green Team but limit to one per office and the impetus to participate in the green office certification program must be driven by staff. With guidance from the Green Team, coordinate an office meeting during which a representative from the GOC will report the office’s assessment results. Then a GOC member/s will facilitate a brainstorming session during which the members of your office (with the help of the representative) will put together your Office Sustainability Commitment and Plan based on the results of your Office Assessment. Action items and goals will be set forth with tentative completion dates. The office will get its green office certificate as well as any items that can help the office operate more sustainably. Implement your plan. Begin taking the steps your office brainstormed during the final meeting. A representative from GOC will compile all of the action items produced from the workshop and send you a link to the formal online version of your office's Office Sustainability Commitment and Plan. Both your office and the GOC team will have access to this document. Treat it like a checklist, and indicate which action items that your office completes. Of course, representatives from GOC will always be available at any time to answer questions or help address issues regarding the implementation. Step 5: Continue to be a champion! Push the boundaries of what it means to be a green office! Encourage other offices/departments to participate. Write a blog entry. Add new items to the commitment plan. Once the office has completed several action items, the GOC team will stop by and confirm the sustainable changes and improve the office’s rating! Certifications are good for 3 years. GOC looks to continue acting as a resource and will be available to arrange a time to continue the education of your office staff about sustainable office and lifestyle practices. We can tailor this opportunity to meet the specific needs and wants of your office as well as fit it within a timeline chosen by you. For example, we could prepare a 20-minute presentation for your monthly staff meeting on the topic that your office staff is most interested in. If you would like more information on sustainability-related learning opportunities please contact greenoffices@ucsc.edu. For a full list of educational resources, visit our website at sustainability.ucsc.edu (click “Certify Your Office” under “Get Involved” and follow the links on the left navigation bar).